An M-Class flare with a double peak took place this afternoon at 20:30 UTC around active Sunspot 1387. 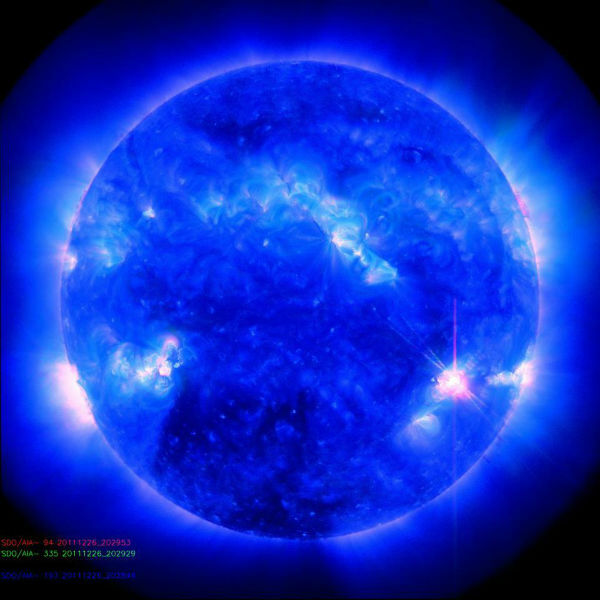 The flare measured M2.3 and was captured by SDO in the image below. A long duration C5.7 Solar Flare was detected around Sunspot 1384 this morning (Dec 26) and may have been the result of a filament channel eruption. An explosion resulted and may also be somewhat Earth directed. 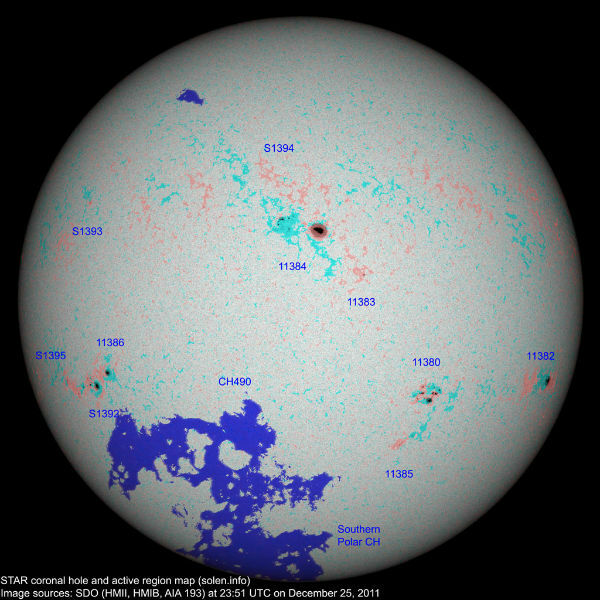 New Sunspot 1387 which formed in the ashes of old region 1380, burst onto the scene quickly on Christmas Day. This region produced three M-Class flares thus far and a partially Earth directed CMEs. M2.3 Solar flare at 20:30 UTC on Dec 26, M1.5 Solar flare occur at 02:27 UTC on Dec 26, followed by numerous C-Class flares (strongest meassured C5.7) and the M4.0 event on Dec 25. The odds of a geomagnetic storm on Dec. 28th are improving with the launch of two CMEs toward Earth in less than 24 hours. NOAA/SWPC gives 70% chance for another M-class flares and 10% for X-class flare events. Solar activity has been at moderate levels for the past 24 hour. Region 1387 (S22W42) has produced two M-class flares, the largest being an M2/Sf event at 26/2030Z. Region 1387 continues to grow, in areal coverage and magnetic complexity as it rotates into a more geoeffective location. Region 1386 (S17E37) also continues to grow and evolve. A proton enhancement at geosynchronous orbit was observed by the GOES 13 spacecraft, with a max flux of 3 pfu at 26/0135. This enhancement appears to be correlated to the M4/1n flare from Region 1387 on 25 December. Protons were again at background level at the time of this report. Over the past 36 hours, 5 CMEs have been observed in STEREO and LASCO C2 and C3 imagery. 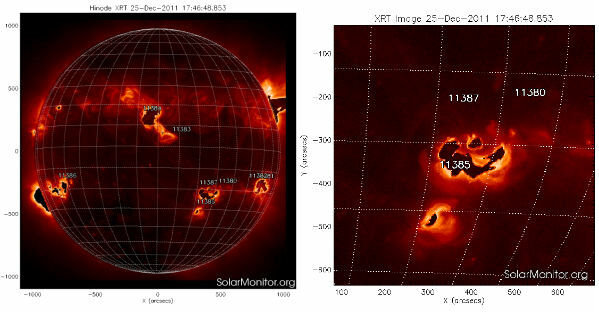 Three CMEs were associated with eruptive filaments and two were associated with flares from Region 1387. Of these five CMEs two are forecast to become geoeffective. Solar activity is expected to be at moderate levels with a slight chance for X-class events for the next three days (27 - 29 December). The geomagnetic field has been at quiet levels for the past 24 hours. 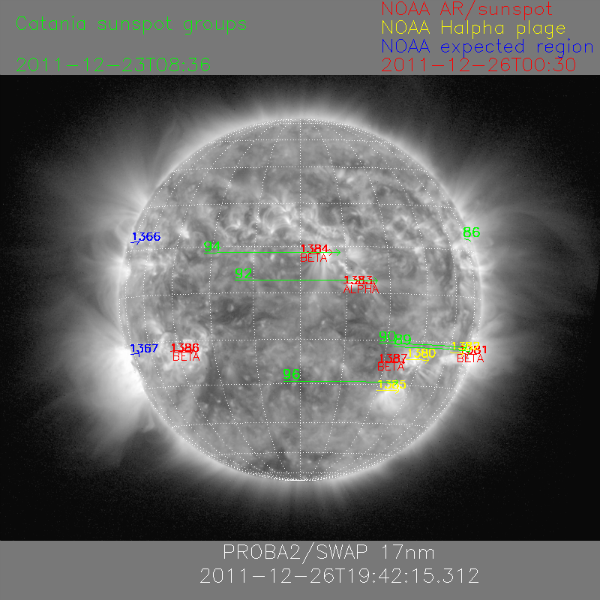 The geomagnetic field is expected to remain at predominantly quiet levels on day one (27 December). 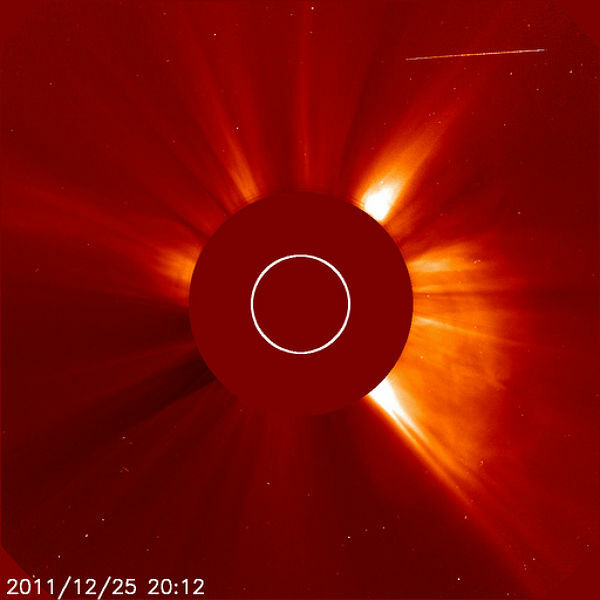 An increase to quiet to active levels with a chance for an isolated minor storm period on days two and three (28 -29 December) is expected as two CMEs, from filament eruptions on 25 December and 26 December, are expected to arrive on 28 December and early on 29 December, respectfully. According to a forecast track prepared by analysts at the Goddard Space Weather Lab, the cloud should squarely strike Earth's magnetic field on Dec. 28th at 20:22 UT (+/- 7 hours). Another CME could deliver a glancing blow a few hours earlier on the same date. The double impact is expected to spark mild-to-moderate geomagnetic storms at high latitudes. Latest Space Weather Advisory Bulletin (#11- 4) reports that a Coronal Mass Ejection (CME) that erupted from NOAA Active Region 1302 on Saturday September 24 is in conjunction with an M7 strength solar flare, arrived this morning at 1237 UTC (8:37am Eastern Time). It has kicked off moderate (G2) geomagnetic storms for low latitudes, but high latitudes are seeing severe (G4) levels of activity. Aurora watchers in Asia and Europe are most favorably positioned for this event, though it may persist long enough for viewers in North America. The bulk of the CME missed the Earth, meaning the storm intensity and duration are less than what they would have been in the case of a direct hit. Region 1302 remains capable of producing more activity and will be in a favorable position for that activity to have impacts on Earth for the next 3-5 days.